RTP Precision Piezo Stages are designed for all kinds of applications where micro or nano-positioning is needed. The clever stages are for the high-end applications which must have high accuracy and high quality whether a single or multiple axis system. This is a complete solution in one product and is powered by PiezoMotion and includes a Renishaw optical encoder. The standard product line has 3 sizes; each 3 have different stroke lengths. RTP Stages table parts are made out of Aluminium and the linear bearings of standard bearing steel with crossed rollers for higher stiffness. Available as options are higher accuracy grades, non-magnetic and high-vacuum compatible solutions, also drivers and software are provided, configured to suit the application. The RTP can support loads and moments in all directions and even customised print or to customers specifications can be opted for. They are designed with PiezoMotor legs making them highly suitable for nano-positioning. There are stroke lengths from 10 up to 100mm with other sizes on request, and options also include multiple axis configurations of XY-XYZ. These high accuracy stages have resolution from 10µm – 5nm, straightness/flatness is 0.5 to 2µm and pitch/yaw <10µm, and in addition there are non-magnetic stages and special drivers. 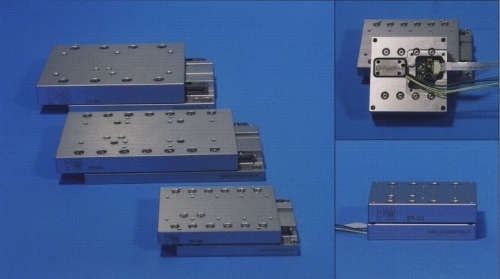 These stages are ideal for moving high precision components which need to be handled with great care and as a further option can be packaged for clean room operation. Yaskawa’s Sigma-5 Servo series has now been enhanced with the introduction of the MP2600iec single axis motion controller. The compact controller/servo combination provides standardised programming on this high quality servo system. The MP2600iec represents a new level of functionality integrated into a single axis. Onboard IEC61131-3 control, digital and analogue I/O, and multiple Ethernet protocols ensure a flexible solution that can be scaled up to meet growing customer needs. The single-axis MP2600iec rounds out the MP2000iec controller family, allowing applications to scale up from single to multi-axis control within a standard IEC61131-3 programming environment. These include MotionWorks IEC, built-in Ethernet/IP and Modbus/TCP (master and slave) connect to most PLC’s and expanded I/O. The PLCopen function blocks within MotionWorks IEC simplify programming, while a diagnostic web server reduces field maintenance time. An optional OPC server allows for HMI or data acquisition. All of these features compliment the enhanced auto-tuning and vibration suppression algorithms standard in the Sigma-5 Servo Amplifier, providing ‘IEC on the Drive’ for a wide range of applications from 50 W to 15 kW. The MP2600iec is a feature-rich product in a small package with point to point motion, electronic gearing and cams, as well as application specific, re-usable custom function blocks. In addition there are 15 digital inputs and 11 digital outputs (sinking or sourcing) on-board, external encoder input and integrated safety circuit (STO). It incorporates multiple programming languages and application codes that can be easily re-used. Further enhancements allow for a more flexible (modular) machine design and the built in connectivity to interface with other products makes it simple to integrate. The diagnostic web server provides the added benefit of reducing field maintenance time. Are your bearings causing you problems? Our colleagues at Spyraflo in the US are playing a role in helping clean up cities the likes of Baltimore, Boston, Queens, NY and Ventura, CA. The ingenious self-clinching, self-aligning bearings are a part of the drive shaft and motor mechanism powering an exciting new cordless compaction system. The manufacturer of the system has introduced a solar-powered, cordless design of their equipment which uses an energy-efficient chain drive system that allows the units to be deployed virtually anywhere, thereby reducing the frequency of collections and greatly reducing associated carbon dioxide and pollution emissions from truck traffic. The decision was made to use the Spyraflo Teflon-Bronze 20mm diameter flange mount bearings that provide important benefits, including non-corrosive housings and a ± 5° static self-alignment capability. They needed to handle a punishing specification supporting a full mechanical load of the machine equalling over 550kilograms of force translated through the motor. The customer selected the Spyraflo bearings due to their many unique benefits including reduced machining and assembly costs, low maintenance during their often-rugged usage, their ability to withstand hot, cold and wet weather and most importantly, their affordability. With each unit having a life expectancy of more than 10 years the choice of Spyraflo bearings was a clear accolade for their long-term reliability as well. One of the most common requirements for Delta Tau projects, whether it is for an astronomical or a high-energy physics application, is software for motion control. These clever products can handle the demanding requirements of optical telescopes needing precise and synchronised motion control of the telescope mount. But then most high-energy physics facilities incorporate large numbers of motion axes that are used to position and move experimental equipment and here again Delta Tauis a leading supplier. Working in collaboration with motion control applications software engineers from Observatory Sciences (OSL), Delta Tau has been involved in motion control applications for many years with a lot of experience gained using the Delta-Tau PMAC (Programmable Multi Axis Controller). Back in the 1990s, PMAC controllers were adopted by the Gemini telescope project to control the elevation and azimuth axes of the twin 8m telescopes. An OSL consultant worked to integrate them with the EPICS software framework that was used throughout the Gemini control system. The work included enhancing the EPICS driver software to support Fast Data Logging on the PMAC itself, at the 2kHz servo rate. This proved extremely useful in commissioning where the data was fed into Matlab for ‘on-the-spot ‘ analysis of problems and help with servo tuning. 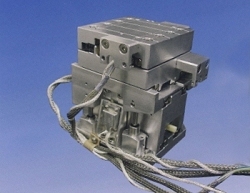 The Gemini system used a VMEbus interface for their PMAC systems, with software running under the Wind River vxWorks real-time operating system. More recently, large experimental control systems have begun to use the Linux operating system and the Australian Synchrotron Project has adopted EPICS with Linux as their software platform. German beamline supplier Accel has supplied several beamlines to the Australian Synchrotron, and Observatory Sciences worked with them to produce a Linux driver for the Delta Tau PMAC2 Ultralite motion controller card. This driver is available as open-source software and can be downloaded from the OSL website. At the Diamond Light Source (DLS) in the UK an incredible 800 motion axes is being installed using Delta Tau controllers to control components in the second phase of synchrotron beamlines. These complement the 700 already installed in the first phase. OSL has worked with Delta Tau PMAC systems throughout the Diamond control system on beamline commissioning and enhancement work being performed by OSL consultants based at DLS. The Delta Tau GeoBrick LV was designed especially for Diamond and can control up to 8 axes of mixed servo and stepping motor types. The latest development of this system has seen OSL produce EPICS software embedded in the GeoBrick LV-PC, to enable plug-and-play EPICS software integration. OSL also worked with Micromech in this successful bid to supply Diamond with Delta Tau’s next generation of PMAC motion controller. In many filling systems one of the challenges frequently faced by manufacturers is the need to separate a single lane continuous product stream of bottles into several lanes in order to bundle them suitable for palletising. The main issue is that obviously bottles require careful handling at high speeds with high dynamic response. The limited stroke length of the linear actuators regularly used in these applications also limits the flexibility of the machine. In partnership with a manufacturer of conveyor systems for bottles and pallet systems a new sync gate was created. The distribution of the product stream took place via a two-axis system with one axis placed orthogonally to the travel direction and a linear drive parallel to the conveyor. A ready-to-mount standard linear actuator with toothed belt was used for this purpose where at the time of distribution, the linear actuator moves synchronously to the conveyor speed. The distributor lid is mounted on the linear actuator. The actuator is first synchronised to the conveyor speed in order to split the product stream and then moves orthogonally to the conveyor direction. After completion of the cross movement, the linear actuator returns to its original position. In addition to the linear actuator the solution included two servo drives and a complete software technology package. If required the servo drives can be integrated via a communication bus option to all common control environments. Thanks to the complete application solution installed it was also possible to bring the machine to market with minimised engineering overhead saving expensive building costs for customers. This advance allowed the machine manufacturer to offer a machine that speeded up the whole packing and palletising process and as a result their customers are delighted with the outcome, higher production and of course reduced costs.